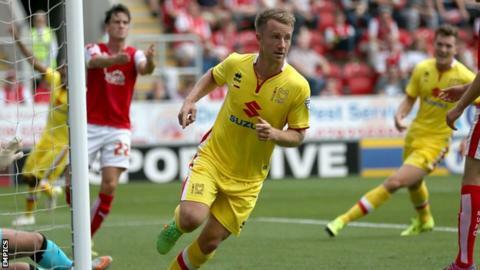 MK Dons celebrated their first-ever game in the Championship in style with a 4-1 win over Rotherham United. Rob Hall gave Karl Robinson's side a dream start as he scored from close range inside the first five minutes. Matt Derbyshire equalised soon after, but the Dons were 3-1 up at the break after a deflected goal for Jordan Spence and one for Dean Bowditch. Carl Baker completed the rout as his powerful second-half shot beat Kelle Roos at his near post. The victory extended MK Dons' unbeaten run in the opening league fixture to seven seasons - they last lost their first league game in 2008 when they were beaten 2-0 at Leicester City. Championship debutants - how have the last six fared on opening day? Hall tapped in from a yard out after Roos palmed out Bowditch's ball from the left. But their lead only last seven minutes as Derbyshire headed in Chris Maguire's corner at the near post. Derbyshire was in the thick of the action as he then went close with another header before having a shot parried onto the bar by David Martin, with Aidy White missing the rebound. But the Dons then took command as Spence's cross took a deflection and wrong-footed Millers goalkeeper Kelle Roos before Bowditch turned in Ben Reeves' cross seven minutes later. Paul Green and Tom Thorpe missed headers in the second half as Rotherham got back into it before Baker blasted his shot into the top corner after a great solo run. Rotherham manager Steve Evans: "If you don't defend right and take chances at key stages of the match it's always going to be tough. "There's no excuse. The defending wasn't good enough. I'm not coming out to make excuses. We'll take it bang in the face and get on with our football. "There has been no shouting and bawling in the dressing room. It's just been a lesson learned." MK Dons manager Karl Robinson: "We were really humbled by the players' performance today. "To be at this level makes us very proud and we put an assured performance in. I don't think I could ask for anything more from the players. "Internally we are very, very confident. To be tipped to go down and finish 24th is tremendous motivation for us. For the first day of the season it is excellent, but we cannot get carried away in August." Match ends, Rotherham United 1, MK Dons 4. Second Half ends, Rotherham United 1, MK Dons 4. Attempt missed. Matt Derbyshire (Rotherham United) header from the centre of the box is high and wide to the left. Assisted by Jordan Bowery with a cross. Corner, Rotherham United. Conceded by Jordan Spence. Offside, MK Dons. Samir Carruthers tries a through ball, but Simon Church is caught offside. Richard Smallwood (Rotherham United) is shown the yellow card. Offside, MK Dons. Carl Baker tries a through ball, but Simon Church is caught offside. Offside, Rotherham United. Lee Frecklington tries a through ball, but Paul Green is caught offside. Attempt missed. Greg Halford (Rotherham United) header from the centre of the box is just a bit too high. Assisted by Joe Newell with a cross following a corner. Attempt blocked. Ben Reeves (MK Dons) left footed shot from the centre of the box is blocked. Assisted by Simon Church. Corner, Rotherham United. Conceded by Kyle McFadzean. Greg Halford (Rotherham United) wins a free kick on the right wing. Substitution, MK Dons. Simon Church replaces Sam Gallagher. Goal! Rotherham United 1, MK Dons 4. Carl Baker (MK Dons) right footed shot from the right side of the box to the bottom right corner. Assisted by Sam Gallagher. Substitution, Rotherham United. Jordan Bowery replaces Chris Maguire. Attempt blocked. Lee Frecklington (Rotherham United) right footed shot from the right side of the box is blocked. Foul by Sam Gallagher (MK Dons). Danny Collins (Rotherham United) wins a free kick in the defensive half. Substitution, MK Dons. Carl Baker replaces Robert Hall. Attempt saved. Tom Thorpe (Rotherham United) header from very close range is saved in the centre of the goal. Assisted by Greg Halford. Attempt missed. Dean Lewington (MK Dons) left footed shot from the centre of the box is too high. Assisted by Robert Hall with a cross. Corner, MK Dons. Conceded by Danny Collins. Ben Reeves (MK Dons) is shown the yellow card for a bad foul. Foul by Ben Reeves (MK Dons). Ben Reeves (MK Dons) wins a free kick on the left wing. Attempt missed. Paul Green (Rotherham United) header from the centre of the box is too high. Assisted by Lee Frecklington with a cross. Attempt saved. Joe Newell (Rotherham United) left footed shot from outside the box is saved in the centre of the goal. Assisted by Richard Smallwood. Foul by Robert Hall (MK Dons).